Bidders were willing to pay over $6 million for this Hollywood car, but it still wasn't enough. This 1935 Duesenberg Model JN Convertible Coupe once belonged to "The King of Hollywood," Clark Gable. 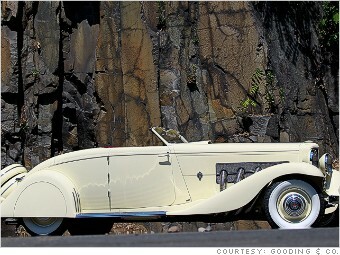 Gooding & Company offered the car at auction in Pebble Beach, California this past weekend. Bidding went as high as $6.4 million but that wasn't high enough to meet the seller's predetermined "reserve" price, so this Duesenberg didn't sell. According to Gooding, the auction company that was offering the car, it played a starring role in Gable's famed relationship with Hollywood beauty Carole Lombard, one of America's biggest stars at the time. The two met at a party after which they went for a long drive.